Costa Concordia has completed its very last voyage by being towed by tug boats and arriving at the Port of Genoa, Italy for scrapping. The ship was boarded by Pilots from the port of Genoa at around 5am Sunday morning as the Concordia wreckage was near to entering Prà-Voltri port. The two tug boats which towed Costa Concordia from the Italian island of Giglio all the way to Genoa were also released from duty. Tug boats from Genoa’s Prà-Voltri port took over towing operations until the ship was at its final position. The wreckage traveled over 200km and was backed up by many other vessels ready for any issues along the way. There was a risk of oil spillage and debris from the ship but it all went smoothly. The Parbuckling Project site released some details about the ship’s arrival including comments from the cruise lines CEO who met the head of the towing operation onboard the Costa Concordia wreck. This morning Costa Crociere Ceo Michael Thamm went onboard the Concordia to meet Nick Sloane and his team. “I wanted to personally thank Nick Sloane and the whole team for the extraordinary commitment they have always demonstrated throughout the project and wish them good work at the beginning of an important day of complex mooring operations” says Michael Thamm. As the ship entered the port there were reportedly many on lookers taking photos and recording the historic moment of a ship which had caused so much tragedy in January 2012 when it struck rocks near the Island of Giglio. The ship listed and Captain Francisco Schettino allegedly jumped ship while many of the passengers and crew were saving themselves. Sadly there were 33 victims. The trial of the captain is still ongoing in Italy. 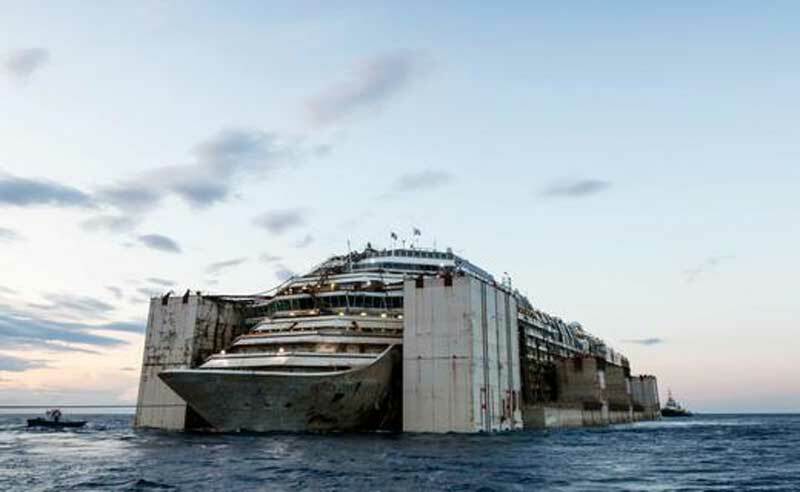 Costa Concordia will now be scrapped in the port of Genoa which is also expected to be worth over 1 Billion dollars to the Italian economy. This also now gives closure to the people of Giglio who have been calling for the removal of the Concordia wreckage ever since 2012.